Modern bioprocesses demand for a careful definition of the critical process parameters (CPPs) already during the early stages of process development in order to ensure high-quality products and satisfactory yields. In this context, online monitoring tools can be applied to recognize unfavorable changes of CPPs during the production processes and to allow for early interventions in order to prevent losses of production batches due to quality issues. Process analytical technologies such as the dielectric spectroscopy or focused beam reflectance measurement (FBRM) are possible online monitoring tools, which can be applied to monitor cell growth as well as morphological changes. Since the dielectric spectroscopy only captures cells with intact cell membranes, even information about dead cells with ruptured or leaking cell membranes can be derived. The following chapter describes the application of dielectric spectroscopy on various virus-infected and non-infected cell lines with respect to adherent as well as suspension cultures in common stirred tank reactors. The adherent mammalian cell lines Vero (African green monkey kidney cells) and hMSC-TERT (telomerase-immortalized human mesenchymal stem cells) are thereby cultured on microcarrier, which provide the required growth surface and allow the cultivation of these cells even in dynamic culture systems. In turn, the insect-derived cell lines S2 and Sf21 are used as examples for cells typically cultured in suspension. 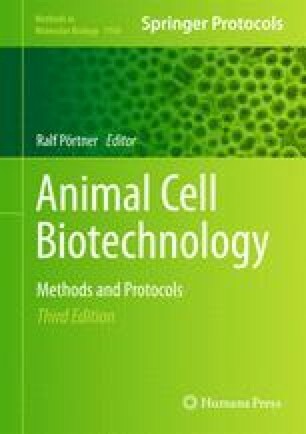 Moreover, the FBRM technology as a further monitoring tool for cell culture applications has been included in this chapter using the example of Drosophila S2 insect cells. The researchers would like to thank the Hessen State Ministry of Higher Education, Research and Arts for the financial support within the Hessen initiative for scientific and economic excellence (LOEWE). The researchers further would like to thank the Federal Ministry of Economics and Technology of Germany (KF2268901UL9) for financial support. The authors are indebted to Roberto Cattaneo for providing MVvac2-GFP(P).